This article is for bloggers and non-bloggers alike. Anyone who has some sort of digital involvement should care about SEO. Without getting too complex, SEO is the great game we’re all trying to win online. Essentially it’s about crafting your online channels, like your website or social media profiles, to help you rank on the first page of Google. You want your website, social channels, etc. to rank on this first page of Google for keywords relating to your practice, so that online users will click on your page before your competition. So, as an example, if you have a physiotherapy practice in St Kilda, online you’d be aiming to rank near the top of the first page on Google for keyword searches like ‘physiotherapists St Kilda’ or ‘physio St Kilda’ or ‘massage St Kilda’. Boosting your ranking with keywords is where blogging can help your SEO. How does your blog do this? How Google chooses the pages it does in each search is complicated and, for the most part, a secret; however, we do know that using keywords helps a great deal. Keywords are still number one on the list of items Google checks when ranking any online channels in search results; you just have to be clever about how you use them. So what you should aim to do is use your blog for SEO purposes by writing legitimate blogs about anything that relates to your healthcare industry, but always by injecting those important keywords. 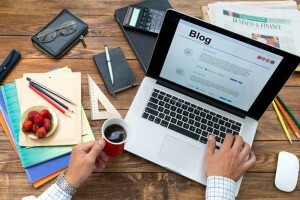 Once a blog is written, you need to optimise this post. Only use one keyword or phrase per blog and include synonyms for that keyword in the blog to show Google you’re not “keyword bombing”. Make sure each blog’s image has the keywords for the related blog in the filename before uploading it to your blog. Try to use headings to give the blog document structure. Inject keywords and synonyms for the keywords in these headings. Google looks at all the content on your site and how it interrelates internally, so always link to at least one other blog you’ve published. Write guest blog articles for other blog publishers, particularly blog publishers who have ‘authorship’. This means look for bloggers in Google searches whose faces come up as a little thumbnail photo beside their result.